The Atlanta metropolitan area is more than 132 square-miles. For local folks, this includes both ITP and OTP (or Inside/Outside The Perimeter a.k.a. Interstate 285). Thanks to our pal PT Umphress, we present to you the all-encompassing, ultimate Atlanta Bucket List. This includes 50 of the finest establishments including restaurants, bars, music venues, museums, festivals and dance halls (welcoming all types of dancing) in the A-town. 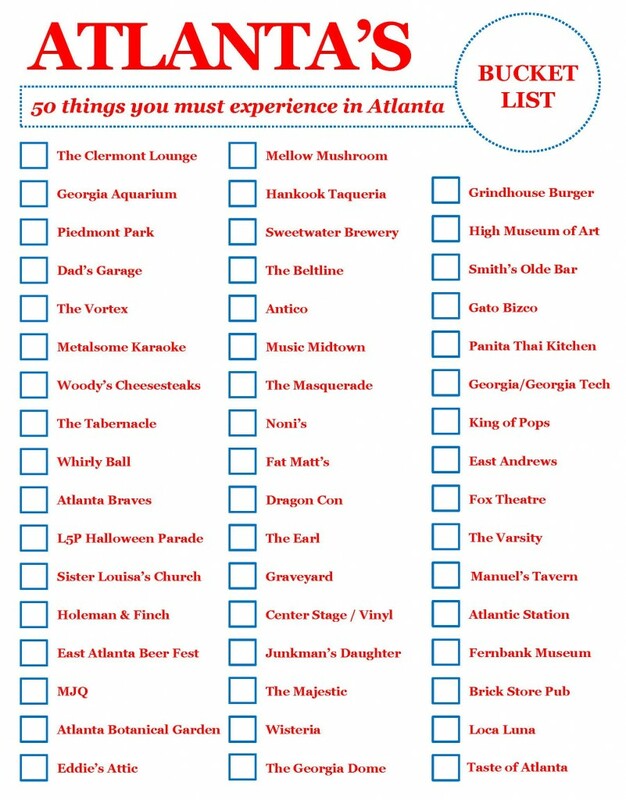 PT even made this in checklist form so y’all can check it off on your adventure. 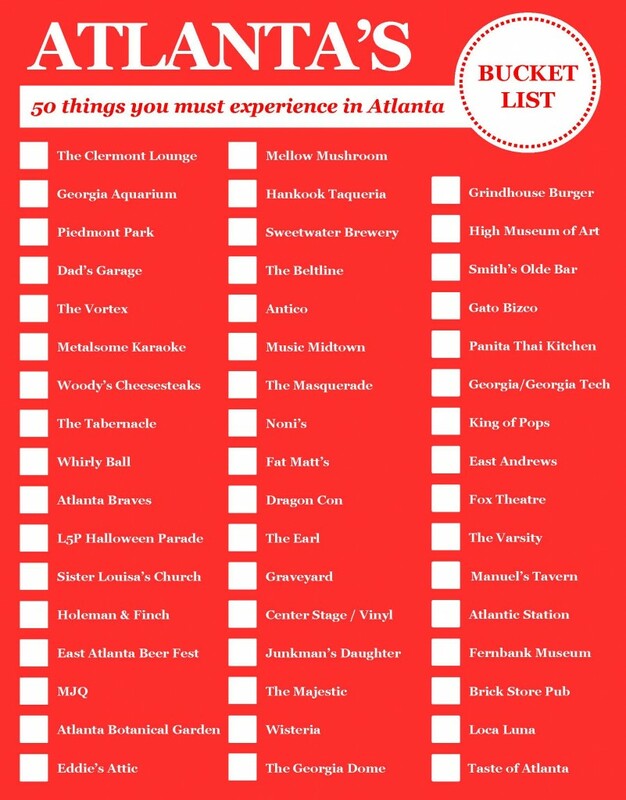 Or, if y’all want to print the PT Umphress Atlanta Bucket List in a bolder scheme – afterall, PT himself is a bold individual – here’s the bucket list in Red & White. 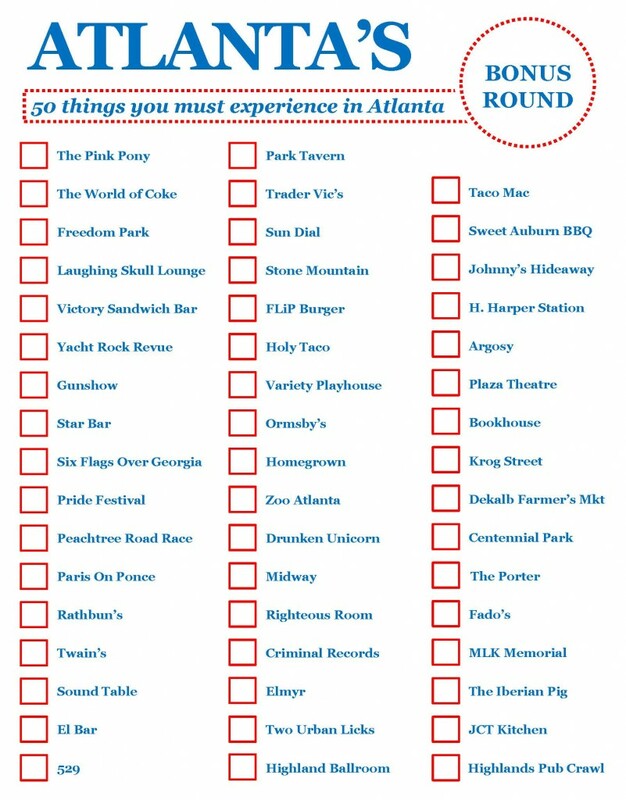 Have any Southerner’s been to one (or all) of the locations on the Atlanta bucket list? If so – please tell us about it in the comments section below. Hey Brooke! We added the Beltline to our list. @Brooke: Large swaths of the beltline are already paved, decorated with local art, and teaming with people. Great addition to the list. @Leah: I agree that OTP should not be considered Atlanta, but most of the items on the list are ITP. All the ones I recognize are, anyway. Cool list! I checked off 36 and I have only been living here a little over 2 years so not bad! I’m trying to figure out if the PT you mention is the same PT I went to high school with… Anyway, I was super excited to see you posted this, because my friend and I were talking about how we wanted to experience more of Atlanta this summer! Becca – that’s such a small world! He’s one of my best friends from my college journalism days.